When you look around, it’s pretty obvious that kids aren’t getting enough exercise, mostly because their eyes are always in front of a glowing screen. They might be exploring, but it’s only a virtual world. 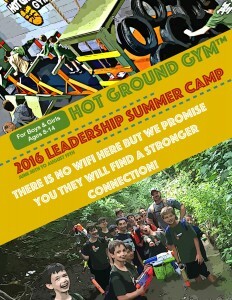 We’re happy to announce the 2016 Hot Ground Leadership Summer Camp in order for kids in the Northbrook area to get the most out of their summer! Our summer camp for kids encompasses everything we’ve learned from running our kids gym, plus we add the wonders of nature so that your child can have the time of their life. Let’s take a look at the benefits of our kids summer camp. Get them away from electronics: Walk into any bookstore or restaurant and they’re always bragging about how they have free wi-fi. Well, we’re here to brag that there’s absolutely no wi-fi where we’re at. At first the kids might complain, but they’re kept so busy new experiences that they soon forget about their connected lives and start connecting with those around them. Let them explore: Kids summer camps are all about exploring. That means exploring the world around them and exploring new activities that might have at first scared them. Once they start looking at the world, they’ll see what a diverse place Illinois can be and have a greater appreciation of the surroundings that they might have been ignoring since birth. Learn leadership: Some people are born leaders, but the skills taught to take control of a situation can be taught. Each child is put into a leadership role at some time, while those who might be accustomed to leadership roles will realize the benefits of working as a team. Get that exercise! : Most kids are lacking in exercise, and even if they’re not overweight they still need to get their heart moving and their muscles growing. Our goal-oriented summer camp for kids will make them exercise their bodies and their minds, ensuring that they realize how important it is to keep both in top condition. We’re strong believers in the idea of “healthy body, healthy mind” and you’ll be amazed at how your children grow. Too many kids spend their summers indoors. Change that this summer with the 2016 Hot Ground Leadership Summer Camp and help your child find something new outside the walls and inside themselves. Find the sign up for it right here.